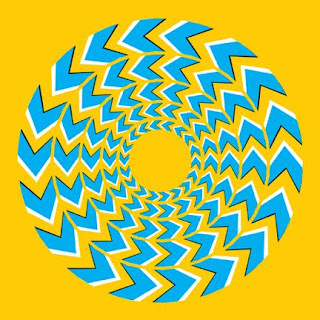 Illusory motion is when we perceive motion when in realtiy nothing is moving. The most well known type of illusory motion is called apparent motion. It is called apparent motion because we perceive movement when in fact there is no actual motion. This topic reminded me of a childhood memory I have. I was in the backseat of my mother's car heading to my grandmother's. I told my mom that the moon was following us. I know now that the moon was not moving that evening, but as a child I truly believed the moon was following us to my grandma's. Illusory motion is everywhere in our world. We use it to create motion in movies and for scrolling signs used as advertisements. I think a pretty good example of apparent motion is the flashing Christmas lights you can buy. My mother has a set of Christmas lights that has six different settings. One of the settings is called chasing, and that is a perfect name for it. When you look at the tree in this setting it appears that the lights are chasing eachother around the tree. When in fact the lights are just blinking on and off at rapid speeds. It is amazing that we can perceive motion of things that are still. 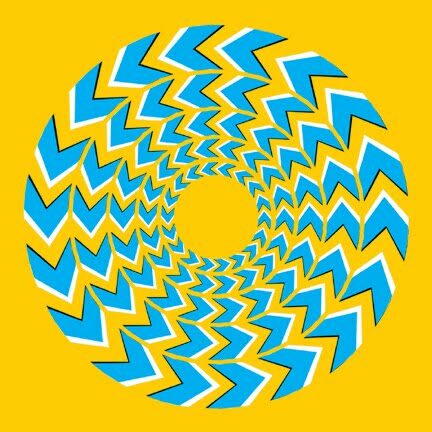 I found an image on the internet that appears to be moving, but like many other things that we perceive movement of it is a still image. I enjoyed your post. When flipping through I stopped when I saw your picture. I was amazed that it seemed to move. I find illusions fascintating. I was going to post about phantom limbs, but that illusion kept catching my eye, so I read your blog and was very intrigued by it. I also think these kind of pictures can explain so much of how the brain really works. I also showed 5 other people this post because it is so amazing. I wonder if there has been any reports of someone going crazy stareing at these?